Sacha and her team will stop at nine Ramsar Sites during the expedition. The Ramsar Convention head a list of hundreds of businesses, charities and individual supporters throughout Europe who are getting behind a unique expedition to save Europe’s smallest swan – the Bewick’s swan – from disappearing. The Flight of the Swans expedition will be the first ever attempt to follow the migration of the Bewick’s swan from the air. 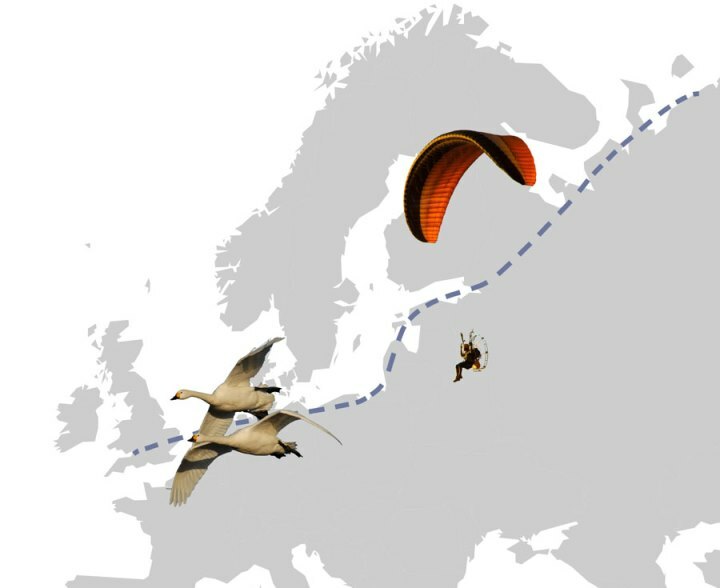 Setting off this September, Sacha Dench of the UK’s Wildfowl & Wetlands Trust (WWT) will fly a paramotor from the Bewick’s swans’ breeding grounds in arctic Russia 7,500km across 11 countries: Russia, Finland, Estonia, Lithuania, Latvia, Poland, Denmark, Germany, The Netherlands, Belgium and France. Biebrza National Park Ramsar Site (Poland); Matsalu Nature Reserve Ramsar Site (Estonia); Lubana Wetland Complex Ramsar Site (Latvia); Nemunas Delta Regional Park Ramsar Site (Lithuania); Vadehavet (Wadden Sea) Ramsar Site (Denmark); Lauwersmeer Ramsar Site (Netherlands); Zwin Ramsar Site (Belgium); Welney, which is part of Ouze Washes Ramsar Site (United Kingdom); Slimbridge, part of the Severn Estuary Ramsar Site (United Kingdom). 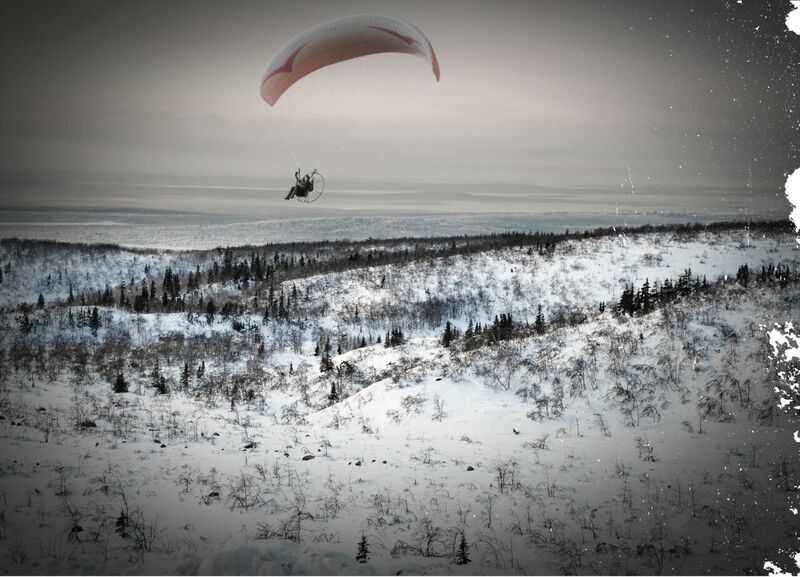 The paramotor is simply a fabric wing, from which Sacha will dangle with a propeller strapped to her back. Flying at the same speed and height as the swans, she will experience the wonders and dangers that the swans face including heavy storms, sea crossings and extreme cold. She will share their view with the world in real time using the latest digital camera technology and satellite communication. Ania Grobicki, Ramsar Convention Acting Secretary General said: “Flight of the Swans is a really imaginative and innovative way to capture people’s attention. Swans and their wetland homes need our help and the help of countries throughout their range. The Ramsar Sites are essential for the survival of these Swans and many other species. There are over 2,200 Ramsar Sites making it the world’s largest network of protected areas”. “I’m humbled by the support that Flight of the Swans has already gained. People all across Europe and Russia are using this expedition as a lever to improve things for the swans, which is all I could have hoped for. Flight of the Swans is being supported by conservation and education organisations in each country that the swans pass through: the Nenetskiy National Nature Reserve, the Russian Academy of Sciences and the Baltic Fund for Nature in Russia, the Estonian Ornithological Society, Tartu Environmental Education Centre, the Estonian University of Life Sciences in Estonia, the Museum of Natural History and the Nature Conservation Agency in Latvia, Birdlife Lithuania, the Nature Research Centre and the Lithuanian Ornithological Society and the Baltic Environmental Forum in Lithuania, the Gdansk Ornithological Station, Biebrza National Park, University of Łódzki, and the Polish Society for the Protection of Birds in Poland, OAG - Ornithologische Arbeitsgemeinschaft für Schleswig-Holstein und Hamburg e.V. and Nature And Biodiversity Conservation Union (NABU) Germany, Vadehavet Wetland Centre in Denmark, Nederlands Instituut voor Ecologie (NIOO-KNAW), Lauwersmeer Visitor Centre Staatsbosbeheer and Dutch Forestry and Nature Agency in the Netherlands, and Province of West Flanders i.a.w. Agency for Nature and Forest Management (Het Zwin nature reserve) in Belgium. They are organising events to coincide with Sacha’s arrival. These meetings and workshops will help progress swan conservation throughout the swans’ range. In addition several international bodies are supporting Flight of the Swans including: the Ramsar Convention, the African-Eurasian Waterbird Agreement (AEWA), and Wetlands International.